Groupe Country US formé en 1992 et comprenant Henry Paul, Dave Robbins, Van Stephenson (après 2/2000), Dale Oliver, Randy Threet et Bobby Huff. 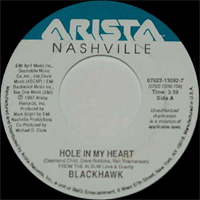 Comprised of a trio of seasoned professional musicians, Blackhawk became one of the most successful new country groups of the mid-'90s, scoring a string of Top Ten hits from their first two albums. 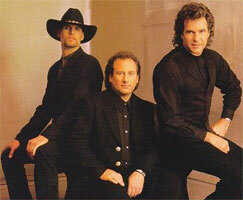 Featuring Henry Paul, Van Stephenson, and Dave Robbins, the band formed in the early '90s, releasing its first single, "Goodbye Says It All," on Arista Records in late 1993. "Goodbye Says It All" sailed to number one, quickly followed in 1994 by the number two "Every Once in a While," the number nine "I Sure Can Smell the Rain," the number ten "Wherever You Go," and the band's eponymous debut album, which would eventually go platinum. Strong Enough, Blackhawk's second album, was released in the fall of 1995 and was equally successful, spawning the hit singles "I'm Not Strong Enough to Say No," "Like There Ain't No Yesterday," "Almost a Memory Now," and "King of the World." Love & Gravity followed in 1997, with The Sky's the Limit appearing a year later. 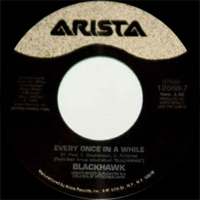 After just four albums, Blackhawk issued its first hits collection in mid-2000.